Summits and Wanderings | Life is an adventure and I'm enthralled with the journey. Life is an adventure and I'm enthralled with the journey. It’s amazing what appears when you are open. I was cleaning up a bit and a paper fell from a full journal I was moving. As I went to tuck it back between the appropriate pages, I glanced to see what it was. 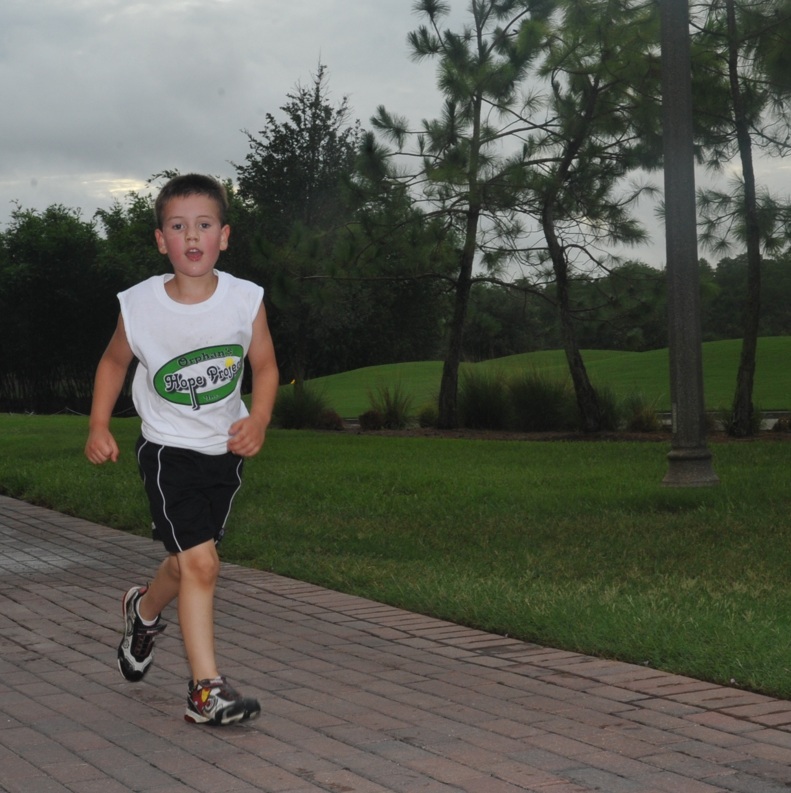 During a trip this summer, Little Man and I ran a 5K with some friends to raise money for an orphanage we support. Toward the end of the weekend event, I was adding things I wanted to do to my Life List. Little Man asked what I was doing and wanted me to write his down too. Visit the orphans for one whole week and play with them, help them buy Star Wars Legos and if people tried to hurt them I would block it. The whispering voice can’t compete with that! What story are you creating today? Why is it such a challenge for me to raise my hand and ask for help? Why do I make it an internal battle to allow someone to do what I am fully capable of? My son would have had curtains hung in his room 45 days ago if, when I ran into challenges hanging the rod originally, I had simply made the call I made this morning. The apartment complex was happy to schedule someone to come and take care of it for me. Let’s see… my choices were: Two minutes on the phone – vs – 15 minutes to correct the situation – vs – 45 days of having an unfinished project hang over my head. Of the three choices, I chose the one that would cause stress. Fascinating. I created another opportunity to beat myself up for not making time, not doing it right, not making it happen… Although all three points are valid and factual – they were unnecessary. Why do I continually look for the stick to beat myself with and if I can’t find it choose to create one? Will Little Man care who hung the curtains – or that they were hung? Which is more important – the task is completed or the task is completed by me? It is time to let things go! I do not have to be the end all be all. Not everything has to be done perfectly and by me… it’s enough that it gets done. What other areas of my life can I apply this realization to? What voice do I hear that continually whispers I’m not good enough? Why do I choose to listen? How do I silence it so I don’t pass it along to my son? If your plan is to hang curtains, it may not be best to start the day with an hour yoga practice focused on arms. If you spend your day doing various home projects, running errands, and reading blogs, the floors will remain unmopped and your work projects will still need to be done. Get home later than you wanted… it really IS part of the process. Add diced onions and let them sizzle happily until they start turning golden brown and your kitchen smells wonderfully. Add several leaves of roughly chopped collard greens. I just tear the leaves off the stems, jullianne them, then run the knife through the pile once. Throw in a good pinch of kosher salt. Once the greens turn brilliant and shiny (a couple of minutes), toss in a handful of sundried tomatos. Sprinkle in a solid shake of red pepper flakes (or two or three) and stir everything around a bit. Add a can of drained and rinsed great northern beans and let everything cook until the beans are warmed. I’m eating mine with a big slice of bread and this one is hitting the spot! The beans are soft and kind of nutty, the tomatos add a nice tang, the greens still have a bit of crunch, the onions are sweet and the pepper adds just the right heat. Thought to table, 15 minutes. I even remembered to snap a picture with my phone before it was all gone. After a day filled with ups and downs, choices and consequences, attaboys and a behavior write-up at school, three nights of homework so we could attend the school concert tomorrow night, fierce hugs and fierce fits, attempted bargining over the amount of dinner eaten in order to get dessert, Little Man acted like a sullen teenager , stomped through the house like he was making wine, whined and wailed like a banshee, successfully put on pajamas, brushed his teeth, got his clothes out for tomorrow and beat the timer by 13 seconds in order to avoid the dreaded no bedtime story. Story was read, giggles were had, second story requested and denied, and the yogurt hit the fan. There was much wailing and gnashing of teeth. Wait – haven’t we already survived the years of the toddler tantrums? It appears we both have more endurance than we used to. I knew what he was doing. Boundries were pushed and held as they had been all night. As a lay there, feeling the sobs leave your body, your ragged breath, your little arm holding tightly to mine I felt incredibly blessed. You are going to experience hurts in life much greater than the lack of a second story after a roller coaster day. I’m not going to always handle things with the amount of grace I would desire. There are going to be things I can’t fix. There will be times when even I am unable to see how the situation fits into the bigger picture of our lives. And through it all, I will be the person you can rail against because you KNOW I love you even when you yell at me. Here’s to fierce hugs and peaceful sighs after the storm. Ryan exclaimed as we left the store, “MOM, I can’t believe this is my very first receipt EVER!” He then proceeded to show that receipt to everyone within 3 feet as we walked to the car. Here’s hoping some of the lessons stick. With a STAR WARS party, there *must* be an appropriately themed cake. 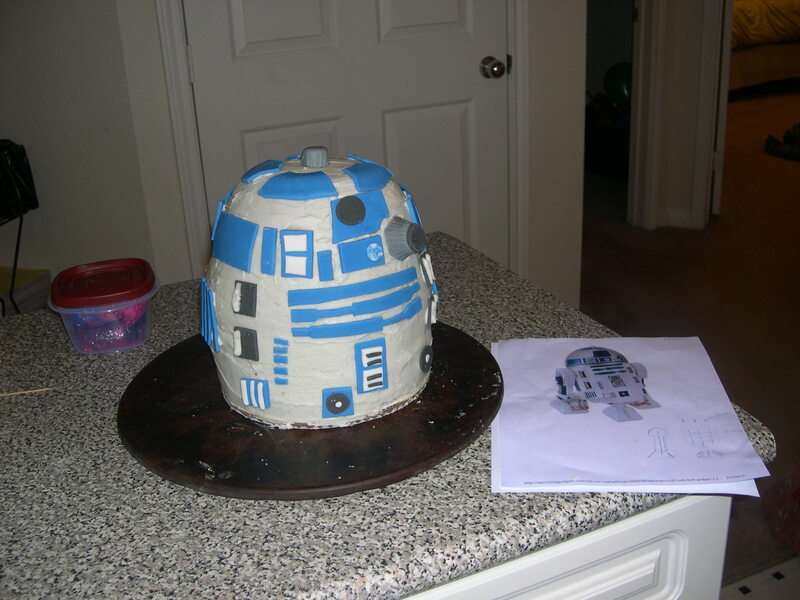 Red Head and I decided on an R2D2 cake. Here’s how I did it. First – I made a list schedule. 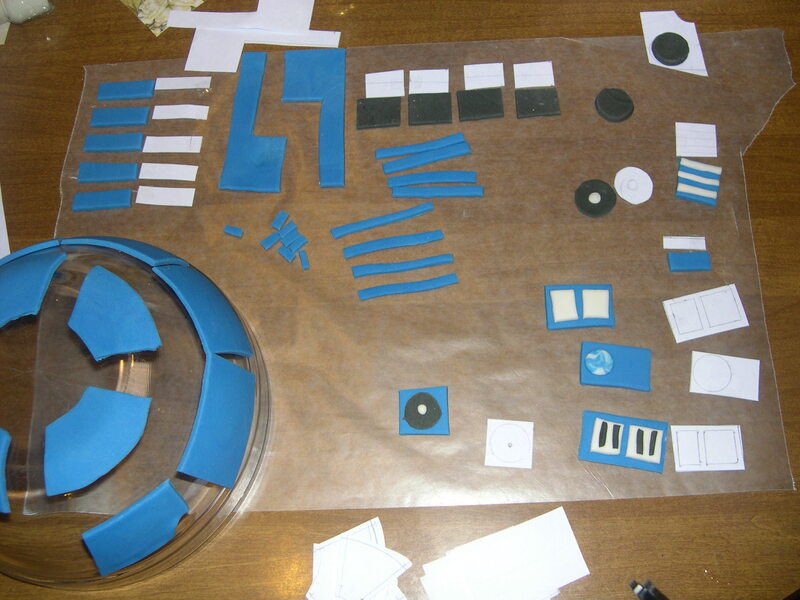 Monday night – I designed the cake and cut out the decoration templates. Paper, ruler, pencil, tape, and scissors. 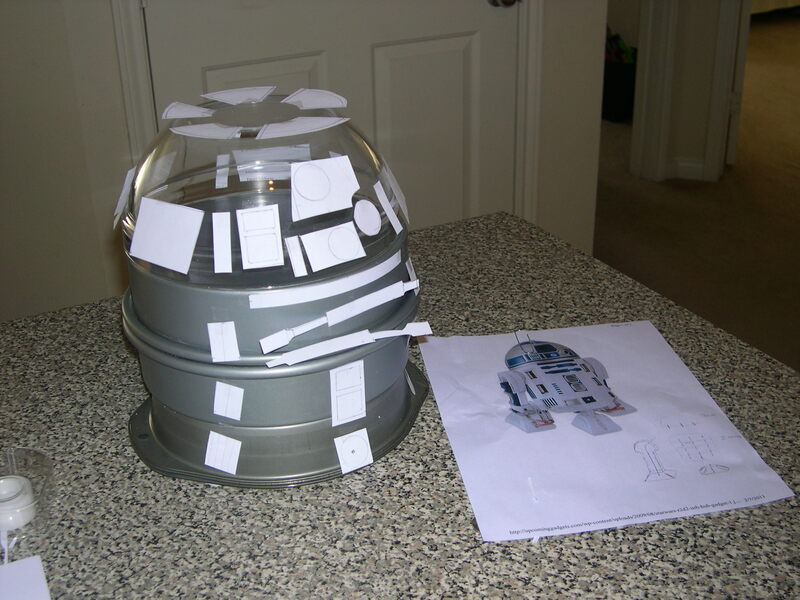 Thank goodness most of R2D2’s stuff is straight edges. Wednesday night – I opened the box of fondant with trepidation. I’ve never used the stuff before and was nervous. It was the most expensive part of the cake. (I used Wilson’s white fondant. I bought the small box and had plenty left over. ) I had to tell myself to, “Just get in there and mess with it. It’s not like you can break it.” Over and over, out.loud. Once I got over myself I mixed the colors. I divided the blob in three very unequal pieces. I used Wilson’s Icing Color to for the blue and black pieces. Side note: A little Icing Color goes a LONG WAY! I used the tip of a tooth pick to transfer the color from the bottles to the fondant. Then it was time for the rolling pin, pizza cutter, and sharp knife to do their work. Attaching the colors together was cool. Take the tip of a toothpick dipped in water and rub on the backside of the top piece. Place it on the bottom piece and tada! they’re attached forever and ever. It made me laugh… it was either that or the fact that it was after midnight by the time I took this picture. 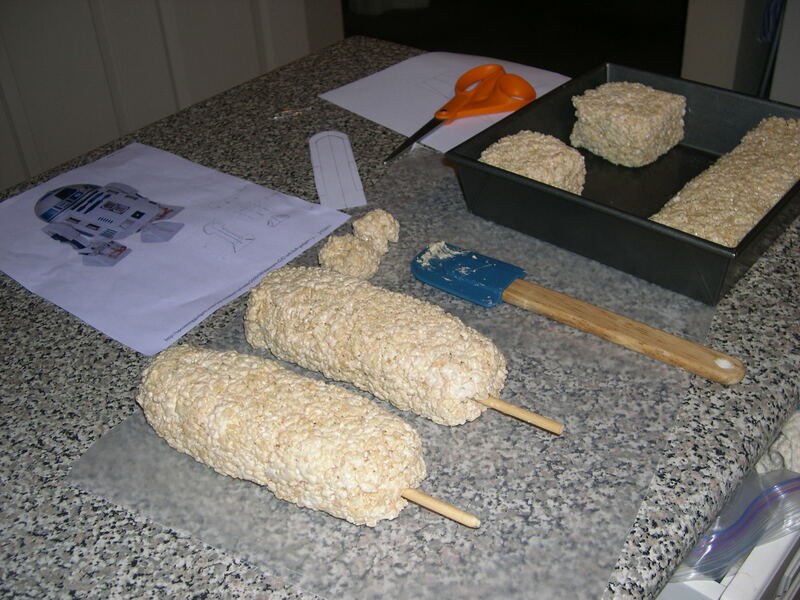 Thursday night – was for baking the cakes and making the Rice Krispy Treats. I did this the night prior to decorating so they would be completely cool and very unlikely to melt the butter creme. To make the legs, I molded the RKT around wooden dowels. I ended up cutting the long piece in thirds for the leg bases. Friday night I built, iced, and decorated the cake. Icing and stacking the cakes: I didn’t realize you were supposed to place little dowels in each layer and use the cake rounds in between each layer. 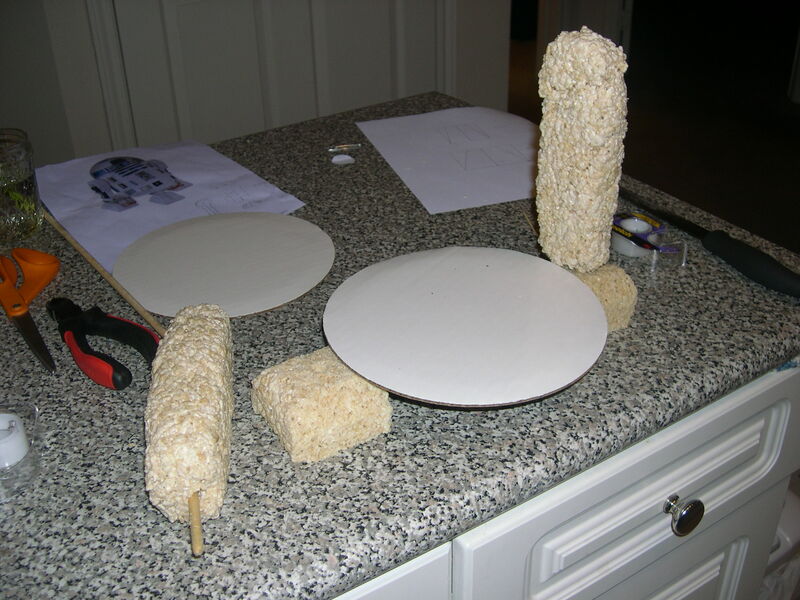 I iced, stacked, then stuck the dowels through the three 8″ round cakes. I baked cake in a mixing bowl to make the top. 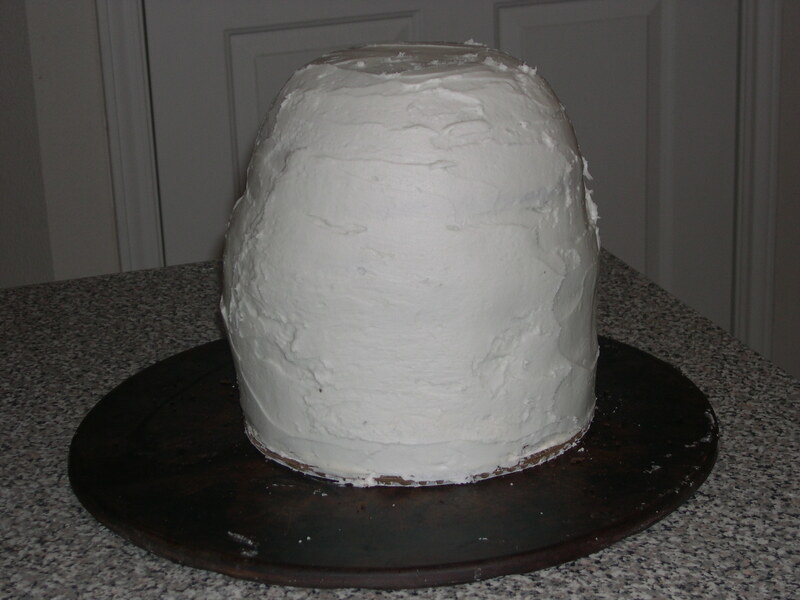 It took three cake mixes to make the 8″ rounds and the head. There were many challenges with the cake mix I used. The ‘head’ came out perfectly. The rounds fell apart. I placed the only one that was completely intact on the bottom, and the two with issues in the middle. I corrected missing pieces by using the butter creme frosting as both bondo and spackle. I’ve been told that frosting covers a multitude of sins. Apparently it’s frosting and mad skills, because just frosting gave this R2D2 a large backside. Did you know that butter creme frosting is yellow?!?! There was a wee bit of panic while I tried to come to grips with a yellow R2D2. The the voice of reason came from somewhere and whispered, “You won’t get white… but how about grey?” And so a couple of toothpickfuls (is TOO a measurement!) of the black Icing Color whipped into the butter creme and I was back in business. I piped butter creme to attach the fondant details to the cake. I alternated between the cake and the RKT legs. Whatever piece I wasn’t working on was resting in the fridge to harden. 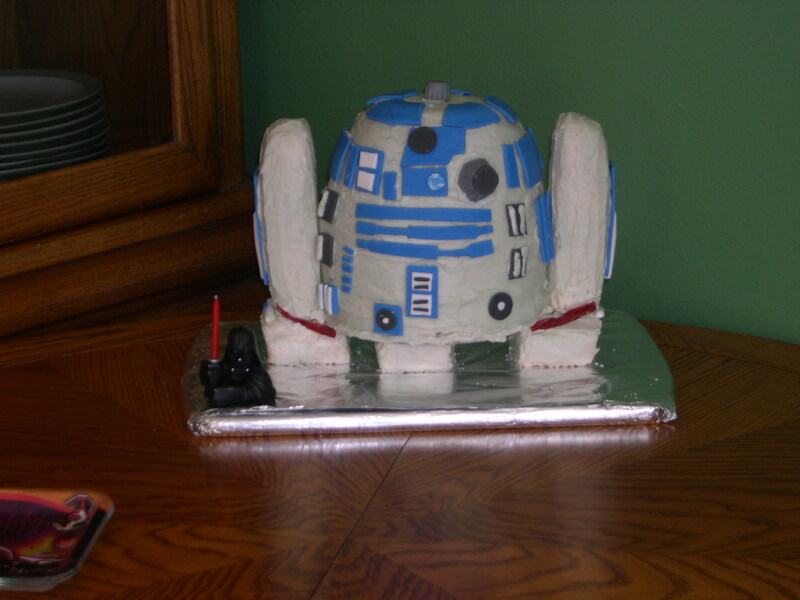 I really didn’t want R2D2’s face sliding down the front of the cake. AND THERE WAS MUCH REJOICING!!! !